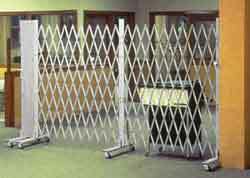 Industrial security gates are intended to cover access points of different types and sizes. They are made from a sturdy, impenetrable lattice work of 14-guage channel steel. An industrial security gate cannot be pushed through or broken down. At the same time, it allows clear visibility either into or out of a building, and it provides ventilation for rooms and buildings that may need to release fumes or excess heat into the outside air. Industrial security gates come in four model styles: single gates, double gates, door gates, and portable gates. Single and Double gates mount on hinge pins that allow you to pivot the gate out of the way so human and/or vehicle traffic can pass safely through the doorway. Drop pins inserted in the center of larger gates prevent the gate from being pulled down from the top or pushed through from the center. This design makes each unit impenetrable and extremely durable. Protection from the elements and added durability also comes from a thick coat of black enamel paint applied to every unit at the time of manufacture. These gates are built for normal sized entry doors that you normally find in any type of building, including offices and modular buildings. They can be left open for both ventilation and light. Easy Rack has sizes that will fit all standard size doors, and we will custom order special size gates to fit uncommon door sizes. Industrial door gates feature a versatile engineering feature that allows them to be mounted to lock on either the left or the right. Security door gates can be mounted either in the recess of the doorframe or on the outside wall adjacent to the doorway. This allows the unit to be folded up and swung to the side much like a door pivots and moved out of the way when it is not being used. These gates are made from a single lattice of steel to cover the entrance to any number of commercial doorways and building access points. Single gates ship standard to lock on the left side, but they can easily be custom built to lock on the right side. The center drop pin reinforces the unit and gives the unit extra strength and stability. Based upon the same design as single gates, double gates are simply two steel lattices that connect together in the center. This allows either side or both sides to be swung 180 degrees to the side and clear the doorway when they are not in use. These are ideal industrial security gates to use in front of entrances that have heavy vehicle traffic, such as fork trucks, pallet trucks, pickups, and vans. These gates are used heavily for construction environments as outdoor barricades and barricades over doorways that have been cut out of the wall but not yet when doorways that have been cut but not completed. They provide mobile security, and when they are folded up they are only 6.5’ high, which m makes them small enough to fit through a standard door opening and compact enough to be stored out of site. Portable security gates are easy to install and lock to the wall with a sample padlock hasp arrangement that Easy Rack includes with your shipment.